David Rampy continued to add to him impressive career total and Michelle Furr and Jeff Strickland remained hot in 2018 taking wins at this weekend's NHRA Lucas Oil Drag Racing Series at GALOT Motorsports Park. Rampy ran down Mark Moreland who took the early lead but could not hold off the charging Rampy out of Piedmont, Ala. Rampy went 4.561 seconds at 144.26 for the win in Comp Eliminator. Furr, coming off a win in Super Gas at the Gainesville Raceway NHRA Southeast Divisional took the win in Super Comp in a close race from start to finish with Sherman Adcock. Furr, Galax, Va., clocked in at 7.660, 143.41 to Adcock's breaking out 7.649 on the 7.650 index. Strickland, who took the Stock win in Gainesville, switched it over to the Hickory Enclosed Trailer Top Dragster and combined a perfect reaction time with a lap of 5.43 on the 5.42 dial for a winning package of .010 in beating out Lindsey Barker, Kathleen, Ga. Strickland, the defending division champ hails from Red Bay, Ala.
David Chiles, Reedville, Va., and Jeff Longhany, Wade, N.C., captured the wins in Super Stock and Stock respectively. Chiles got a big holeshot and continued to pull away from William Sloan in his '08 Cobalt while Longhany was out first on Clay Bullard, Camden, S.C., and held on for a close win by about 2 inches (.0010 seconds). Other winners celebrating in winner's circle were Sergio Santovenia knocking out Craig Porter in Super Gas; Jonathan Anderson beating Mark Proulx in Super Street and Jeff Brooks over Donny Urban in the Stott's Ford Top Sportsman class. In NHRA Summit Racing Jr Drag Racing League action it was Brendan Miller leading the way with a win over Ashley Dunahoo in the 13-17 year old class. Budd Trammell II ousted Logan Westmoreland for the 10-12 trophy and Alyssa Rabon held off Hayden Miler in the 6-9 class. 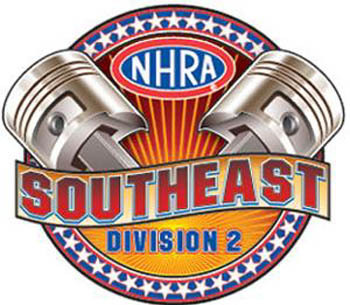 Many of the Southeast Division racers will head to zMAX Dragway for the NGK 4Wide Nationals April 27-29, then to South Georgia Motorsports Park for the next Southeast Divisional event, May 18-19. David Rampy, Piedmont, Ala., '32 Bantam, A/EA, 4.561, 144.26 def. Mark Moreland, Edenton, N.C., '98 Pontiac, H/SMA, 5.791, 116.21. David Chiles, Reedville, Va., '08 Cobalt, GT/EA, 5.951, 111.34 def. William Sloan, Sanford, N.C., '00 Grand AM, SS/CS, 5.973, 113.42. Jeff Longhany, Wade, N.C., '00 Pontiac, AA/SA, 6.514, 100.58 def. Clay Bullard, Camden, S.C., '98 Pontiac, B/SA, 6.510, 101.67. Michelle Furr, Galax, Va., '02 Undercover, 7.660, 143.41 def. Sherman Adcock, Fortson, Ga., '11 American, 7.649, 151.02. Sergio Santovenia, Boca Raton, Fla., '69 AMX, 8.566, 139.73 def. Craig Porter, Silver Spring, Md., '04 Mustang, foul. Jonathan Anderson, Williamson, Ga., '05 Pontiac, 9.387, 119.21 def. Mark Proulx, Osgoode, Ont., '65 Comet, 9.407, 101.15. Jeff Strickland, Red Bay, Ala., '14 American, 5.430, 189.23 def. Lindsey Barker, Kathleen, Ga., '18 Miller, 5.261, 201.31. Jeff Brooks, Fredericksburg, Va., '51 Henry J, 5.684, 171.75 def. Donny Urban, Selma, N.C., '06 Cobalt, foul. Brendan Miller, Canterbury, Conn., dragster, 8.122, 77.29 def. Ashley Dunahoo, Roanoke, Va., dragster, 7.948, 80.06. Budd Trammel II, Aynor, S.C., dragster, 8.945, 71.34 def. Logan Westmoreland, Greenwood, S.C., dragster, 9.066, 70.62.